Legendary Jazz musician tenor and baritone saxophonist Charles Davis has died. Jazz musician Charles Davis, on tenor saxophone at Minton's Playhouse in Harlem. 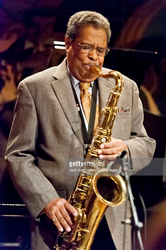 Legendary Jazz musician tenor and baritone saxophonist Charles Davis has died on July 15, 2016. He was 83. Davis was a jazz musician, composer, performer and educator. Born in Goodman, Mississippi, Charles Davis was raised in Chicago and graduated from DuSable High School before studying at the Chicago School of Music. Davis also studied privately with John Hauser. He played with Billie Holiday, Ben Webster, Sun Ra, Lionel Hampton, Dinah Washington, Philly Joe Jones, Shirley Scott, Illinois Jacquet, Elvin Jones and Ahmad Jamal to name a few. He also performed and recorded with Kenny Dorham, with whom he associated musically for many years. He recorded and toured the world accompanying the Clifford Jordan Big Band, Barry Harris Jazz Ensemble, Aaron Bell and the Duke Ellington Tribute Orchestra, Roni Ben-Hur and the El Mollenium Band, the Charles Davis All Stars, Apollo Hall of Fame Band and was the musical librarian for Spike Lee's Mo Better Blues. In 1964 he won Downbeat's International Jazz Critics Poll for the baritone saxophone and in 1984 he was named a BMI Jazz Pioneer. Davis was a saxophone instructor of private students from The New School; a teacher at the Lucy Moses School and for over 25 years was an instructor at Jazzmobile and also trained students internationally. He leaves behind his legacy in his recordings and his family: daughters Linda Harris and Talya Wilkinson, sons Louis Davis and Lewis Holmes, grandchildren Chantell Harris, Danielle Walker, Fyielle Howard, Rachelle Jennings and Shakeem Jennings, seven great-grandchildren, a host of relatives, friends, fellow musicians and students. He has released multiple albums and is featured on over 100 recordings. Recent releases include "For the Love of Lori," a tribute to his late wife Lori Samet Davis with Steve Davis on trombone, Rick Germanson on piano, David Williams on bass, Joe Magnarelli on trumpet and Neil Smith on drums released in 2014 on Reade Street Records; “Blue Gardenia,” with Cedar Walton on piano, Peter Washington on bass and Joe Farnsworth on drums, released on Reade Street Records; “Land of Dreams,” with Tardo Hammer, Lee Hudson and Jimmy Wormworth, released in 2007 on Smalls Records; and “Our Man in Copenhagen,” released in October 2008, on Fresh Sound Records, with Sam Yahel, Ben Street and Kresten Osgood on which they play the music of Bent Jaedig.